Save $5 on two Disney family films on Blu-ray! 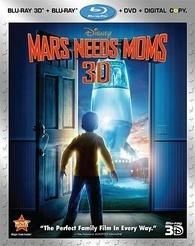 Disney has another coupon offer to save $5 on both the 'Mars Needs Moms' and 'The Fox and the Hound 1 & 2' Blu-rays available August 9. Click this link to access to the page where you can print out your coupon valid at participating retail stores. Printable coupons are available for both the U.S. and Canada and the promotion expires on August 14.